For the past 15 years, my chronic illnesses journey has seen me try various diets and medications. This has all led me to read food labels carefully, research ingredients, be careful what I put into my body and ultimately make changes in my diet to live a healthier life. Many of you know I have a love for skin care and even worked in the skin care industry on and off for 5+ years. This led me to develop a deep knowledge of what goes into our skin care and beauty products. 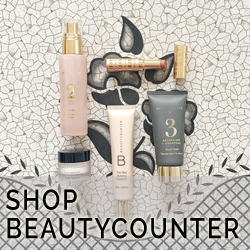 So, a month ago I became a Beautycounter consultant because Beautycounter sets itself apart. Their mission is to get safer products into the hands of everyone. Currently, the EU has banned or partially restricted 1400 ingredients from personal care products. Here in Canada that number is less than 600 and in the U.S. it’s 30. But now you have the option to swap your skin care and beauty products for safer versions with Beautycounter. Since joining, I’ve been able to try many of the products (the product line keeps growing!) and have developed a few favourites which have now become staples of my skin care and beauty routine. Plus, the Holiday Collection just launched so I’ll list a few of my most-wished-for gifts! If you’re ready to make the switch to healthier skin care and beauty products, I’m here to help. I can put together a personalized skin care routine, or help you replace your beauty products one-by-one. Shop online or send me a message at laura@alushlife.ca with any questions you might have!